Lace up your skates and set out for an enjoyable glide through the 250 metre looped trail’s natural setting! The trees surrounding the trail are native to the area and many were transplanted from other areas of the park during the park’s redesign. With the twinkling lights in the trees and music in the air, this is an outdoor winter tradition you’ll want to experience! Located on the west side of Richmond Green Park behind Tom Graham Arena, the Skate Trail operates seasonally for ice skating from December 1 to March 15, weather permitting. You can also inline skate from April 1 to November 1, weather permitting. For further information, please call 905-771-5490. Skating hours are subject to ice/weather conditions. 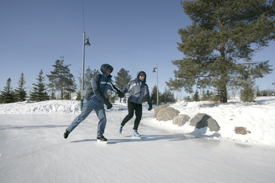 Skating rinks are dependent on the ice and weather conditions, and are monitored daily by parks staff. A minimum of 19cm or 7 1/2 inches of solid ice with no surface water, or melting edges is required to open the ponds for safe public skating. Please Note: All locations use a flag system to inform the public of ice conditions. RED flag means skating is not permitted and there is no skate patrol on duty. YELLOW flag means ice is of sufficient depth for skating – proceed with caution. For further information please call a Customer Service Representative at 905-415-7535. Visit www.markhamskaterentals.com for information on ice skate rentals. The Newmarket Riverwalk Commons Tim Hortons Skating & Water Feature is a free outdoor rink located at 200 Doug Duncan Dr. This space is a free skate during operating hours and is subject to weather conditions. Approximate season is December to March. The Recreation and Culture Department will continue to offer the full complement of Public ice time programs (in addition to those listed above). However, due to the many factors which affect ice scheduling (maintenance, tournaments etc.) we will provide the most current schedules onsite at the Ray Twinney Recreation Complex, Magna Centre, Town Hall and online at Newmarket.ca. This will ensure that schedule information is always as current as possible.